Functional ingredients allow sleepy bars, shakes, snacks and dietary staples to turn into super foods. And judging from market growth, people are into it. The convergence of food and dietary supplements has never been an all-at-once proposition. Cereals and milk have been fortifed for years. Jamie Lee Curtis was gushing about Activia yogurt a decade ago. Now probiotics are showing up in everything from protein powder to pancake mix, and once-exotic ingredients like functional mushrooms and turmeric are sneaking into teas and enhanced granola bars. And those are just the packaged goods. The smoothie nation is boosting its concoctions with greens and other mixes that are fortified with all manner of nutritional advantages. The convergence may be decades in the making, and yet it seems to be everywhere all at once. NBJ predicted years ago that smart companies would increasingly seek to align supplements with food. And we were right. When an ingredient adds a benefit that doesn’t come at the expense of taste, anything can go into anything. So why do functional foods seem to be showing up everywhere all at once? Because they can. 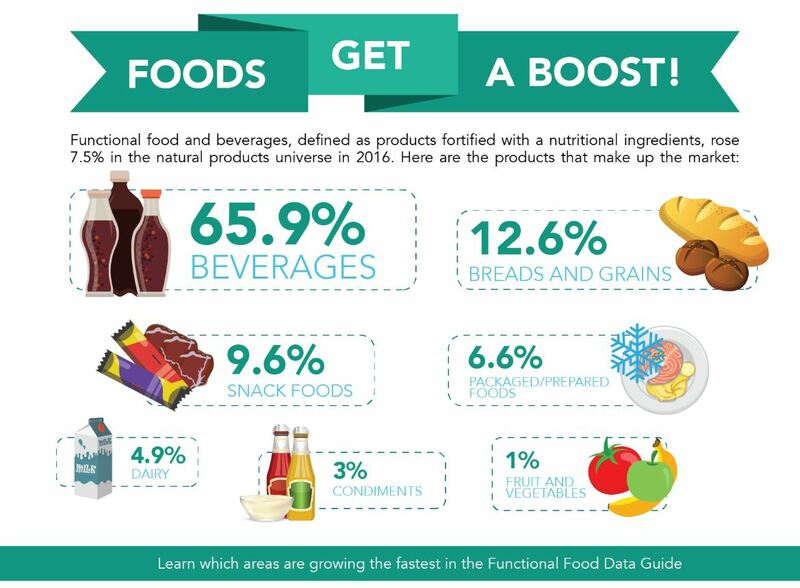 See the products that make up the market in our visual below, and purchase the Functional Food Data Guide for a full look into the opportunity.